I am starting this month with some great news from Shakey's! Their latest offering dubbed as The Shakey's Grand Slammin' Deal allows guests to pair their favorite pizza combination with a generous serving of signature starters OR pasta, PLUS a pitcher of Nestea or Coca-Cola softdrink. For starters, you can choose from Calamari Crrrunch, Buffalo Wings or Wings 'n' Rings. If you are a pasta lover, you can opt for the deliciously creamy Carbonara Platter or the delightful Spaghetti Platter. 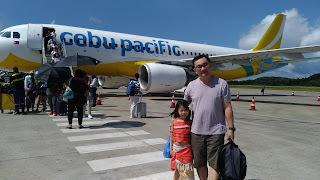 Next, you can select from the original four pizza flavors like Shakey's Special, Pepperoni, Classic Italian Sausage ad Friday Special or the new combination flavors like Angus Steakhouse, Hi-Protein Supreme, Pizza Castellana and Managers Choice. Lastly, you can choose your favorite drink. But wait, there's more! 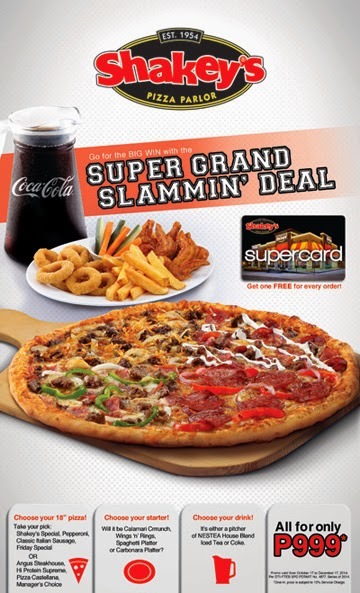 When you order the Shakey's Grand Slammin' Deal, you are also entitled to one free Supercard (worth PhP 399)! You can read about the benefits of owning Shakey's Pizzanatic Supercard Version 2, here. All these treat for only PhP 999* (PhP 1,100 if order is for delivery)!